Overall view of the Masterplan from the south. With the rise of new mental health policies in Ireland, the number of patients staying at the hospital—once as high as 2,000—has decreased dramatically. The Health Service Executive (HSE), Ireland’s public healthcare provider, was seeking a way to more fully utilize the campus and the site. Meanwhile, the Dublin Institute of Technology (DIT), one of the largest institutions of higher education in Ireland, had long been looking for a place to consolidate from its 39 different locations scattered around the city. Today, education is all about synergy between departments, staff, and students, and it was long past time for DIT to have a real campus where this interaction and synergy could take place. 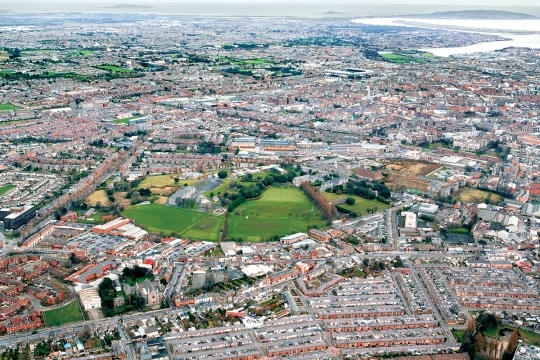 The Grangegorman site offered the potential to solve DIT’s real estate problems with one campus in a central location. The Irish government deemed that the underused St. Brendan’s campus could become a vibrant urban quarter with new facilities for both DIT and HSE. 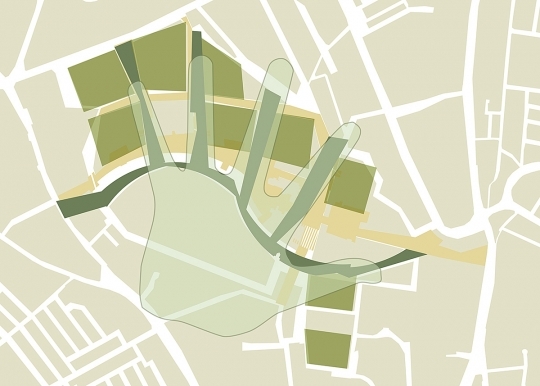 The Grangegorman Development Agency (GDA) was formed, and in 2006 it held an international design competition to prepare the master plan for the redevelopment of the site. I first heard about it while I was in Dublin judging a design competition for the Gateway Project at University College Dublin. Of course, the Grangegorman competition piqued my interest. Having grown up in this neighborhood, I have a very thorough knowledge of the area. In addition, I’d studied and graduated from DIT, so the project really appealed to me. I am very familiar with all the streets, alleys, and adjacencies travelling from home to the DIT-Bolton Street building, cutting through the King’s Inns and Henrietta Street. I also used to ride my bicycle through the back alleys when I was young. I had come to the United States in 1982 with a scholarship to study at UCLA, and have settled in California since then. 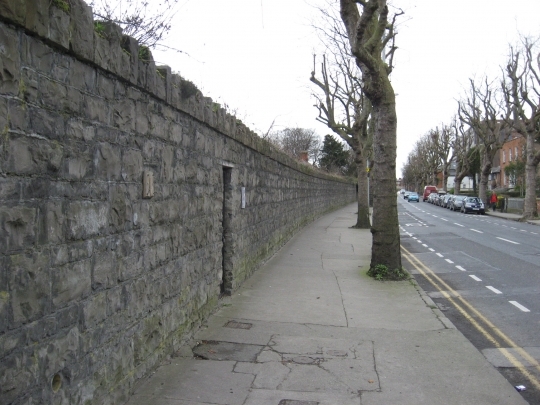 For centuries, the Grangegorman site has been cut off from the rest of the city by a stone wall. I always thought the site was a missing link in the urban fabric of the north side of the city. So in our approach to the competition design, we opened up the campus with new entry gateways to reintegrate the site with its surroundings, but we also preserved significant pieces of the historic wall. Our concept maintains the existing green open space in the southern part of the site, keeping most the existing trees—a lot of them are 200 years old—while incorporating buildings only on the northern part of the site. There are not nearly enough open spaces in the core of the city. I remember that after we had won the competition, during the public and community engagement process for the master planning stage, a 90-year-old woman came up to me and held my hand and said, “When I look out the window now, I see trees. Tell me you’re not going to change that.” And I could truthfully respond that we weren’t going to. The development’s financial aspect proved to be a challenge for the Irish government. The original plan—this was back when the “Celtic Tiger” boom was in full swing—was that DIT would sell its 39 different locations, some of them in prime areas, in order to fund the building of all these projects on the Grangegorman site. Then the economic downturn hit and most development in the country came to a standstill. Aerial view of the site looking east. In many recently expanding economies, like China, development was mainly about exploiting land for profit, usually to build housing. Similarly, during the Celtic Tiger years, Ireland was also building tens of thousands of housing units per year. But the Grangegorman redevelopment isn’t about real estate. It’s about educating the next generation and enhancing the future of Irish people. So luckily, the Irish government has deemed Grangegorman to be of national importance, having significant, far-reaching implications for the wider community and Ireland as a whole. A way was found to get the project going with limited funding. Inch by inch, step by step, thanks in large part to the tremendous efforts, dedication, and perseverance of the GDA and DIT, the project is becoming a reality. It’s one of only a handful of significant public projects in Ireland that have been approved to go ahead during the recent recession, with strong support from the Irish government, the Department of Education, and the local community. We’ve now finished the master plan; the landscape, public realm, and infrastructure elements are being built, with buildings to follow. DIT wants to occupy the campus right away, with 1,000 students on site by this fall term. Eleven existing historic buildings on the Grangegorman site will be repurposed for new uses in the master plan. With very little money, the GDA has been able to renovate several of these historic buildings at this time, and students will be taking classes in them starting this September. Eventually, with the completion of the campus planned for 2020, DIT will accommodate a population of 21,500 students and 2,500 faculty and staff, with a further potential increase of 30%. 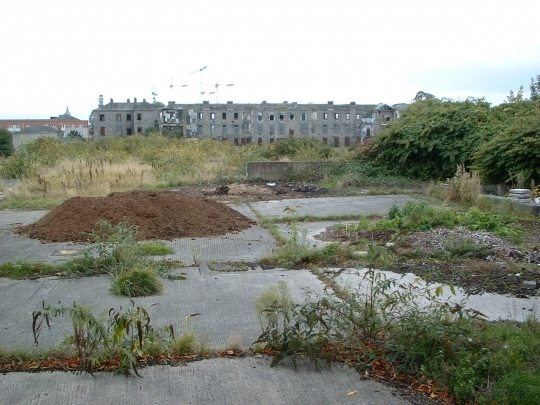 When we started the project, the psychiatric hospital still had about 80 patients at Grangegorman. Last year, they were moved to the HSE’s brand-new Phoenix Care Centre on the campus. The doctors have told us that the patients who have moved in here need much less medication than before—a testament to the better environment that has been created. A new primary care facility will be coming next. In the near future, two of the major academic quads (the Central and Eastern Quads) will be created through public-private partnerships with funding support from the Irish government and the European Investment Bank. The briefs for these quads have already been released for development consortiums to bid on. Some of the new iconic buildings that are being planned, like the library and the business school, will undergo a design competition process. New student residential buildings will also follow on the campus. In most campuses, student housing is built in a quadrangle configuration. But we decided that wasn’t the right approach here. Instead, the master plan provides housing all the way through the campus, creating a “main street” and lively public realm for students. 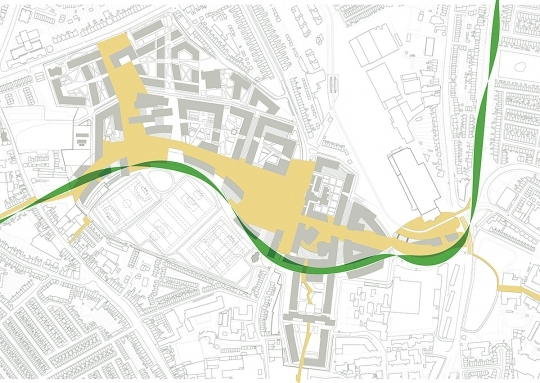 A second, landscaped path—the Serpentine Walk—counterpoints the main path to provide a more informal means of access to the buildings. Fortunately, the city minimized parking requirements on the site, while optimizing public transportation provisions and access. Part of the Grangegorman development includes a new northern line for Dublin’s Luas light rail system, with two major stops at the campus. These elements are all currently under construction. The looser framework of the “open hand” at conceptual design phase was an important template in our approach. We valued creating a number of centers which we thought could engage the other buildings. We wanted to leave breathing space around the buildings to create spaces for social engagements—a sort of learning landscape. The Irish climate calls for narrower buildings to ensure interior daylight. Landscape “fingers” between the buildings lead to the “palm” of the site—the playing fields. The open hand is a symbol of the goals of education and the invitation to the greater community to use the site and its facilities. The experience afforded by the master plan will be open and will result in a collective education. DIT’s future will bring together many strands of learning on one campus, which will enrich learning for every student. Immigrants usually don’t get a chance to return and give back to the community they left. Because I had won that scholarship 30 years ago, I feel that this project is a way for me to give back to the place I grew up in, to bring back what I’ve learned to my mother country. For Dublin, this project is a rare opportunity to add a new, vibrant urban quarter campus to provide education and healthcare to the heart of the city. Chances like this only come along once in a lifetime. I hope that my fellow alumni from DIT will also offer support to our alma mater as it settles into its new premises at Grangegorman in the coming years.